It’s beginning to feel a lot like Christmas, isn’t it? 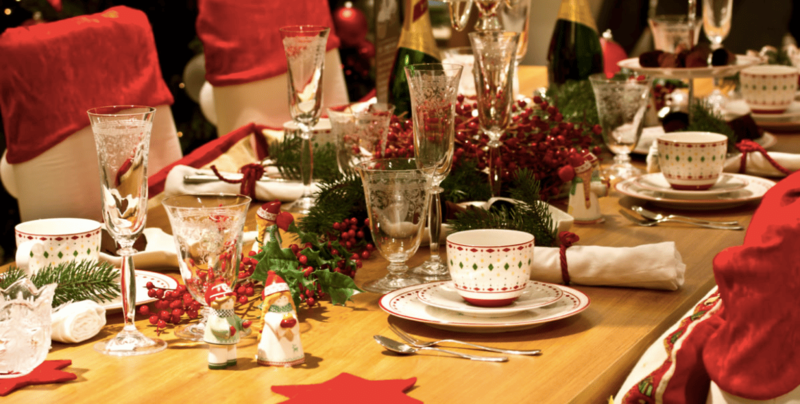 December has just begun and we can already feel the Christmas energy in the air! 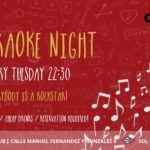 Spending Navidad in a different country is a really magical experience, so don’t miss out on any of the unique and special things going on around the city for the month of December. Even if you don’t celebrate the holiday, you will still enjoy Madrid around this time of year because there is just so much to do! 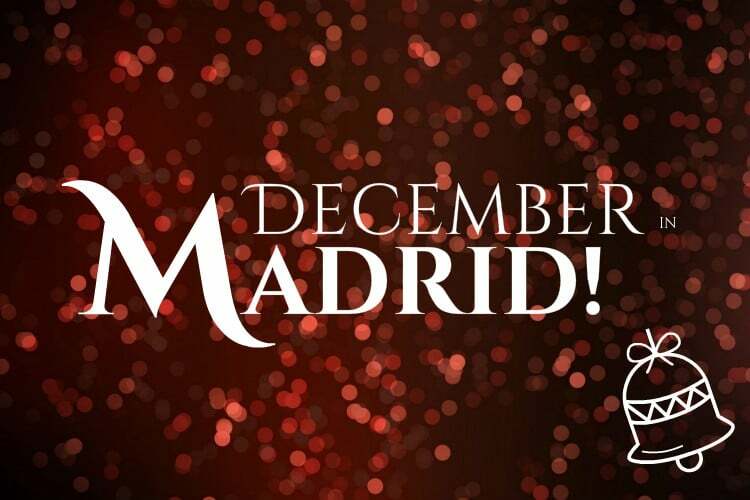 Check out our list below of some of the best things to do this month to fully experience a typical Madrileño Christmas! 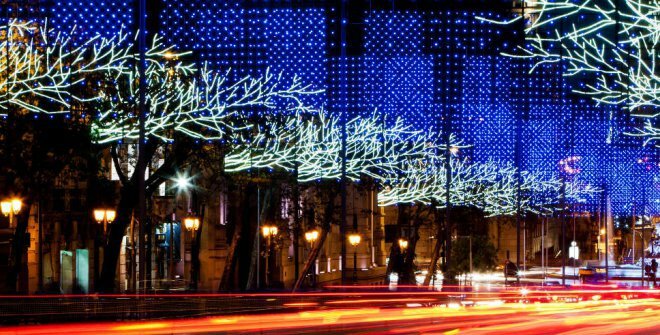 Every year, each neighbourhood of Madrid get’s dressed up in their best Christmas lights! For the month of December, the streets will be lit up by various light displays that have been created by artists all over the world. Typically, each barrio will have it’s own unique displays that are lit up every day between 18:00 and 23:00, with longer hours on both Christmas and New Years eve! So, take your camera, and explore Madrid’s festive streets! 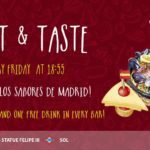 If you’d like to know which artists are behind each display, check out the official info page at EsMadrid! It wouldn’t be Christmas without the markets! 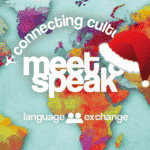 The Spanish people love to be out and about, especially during special holiday seasons. That’s why, for the month of December you will notice several plaza’s, street corners and churches transforming into adorable little Christmas markets. The best way to get the most of these markets is to simply explore your neighbourhood! There will be markets all over the place selling traditional food, artisan products and christmas crafts! Some of the bigger markets worth noting are: Mercado de Navidad (Plaza Mayor), Fiera Mercado de Artisania (Plaza de Espana), Navidad en Oriente (Plaza Opera), Medieval Christmas Market (Plaza Jacinto Benavente) the Ice Rink, craft shop and the Christmas Tree and children’s show (Plaza Callao). For more info go here. 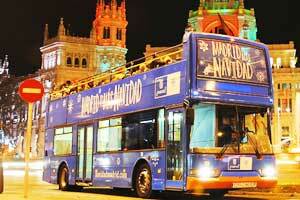 This festive Christmas themed double decker bus tour will take you on a 50 minute night tour through Madrid. On the tour you will see all of the beautiful Christmas light designs around the city. You can catch the bus at Plaza Colon and tickets cost 4€! This isn’t a hop on, hop off type of tour. There is only one stop on the tour, at Serrano 30 where you will get on and off the bus! 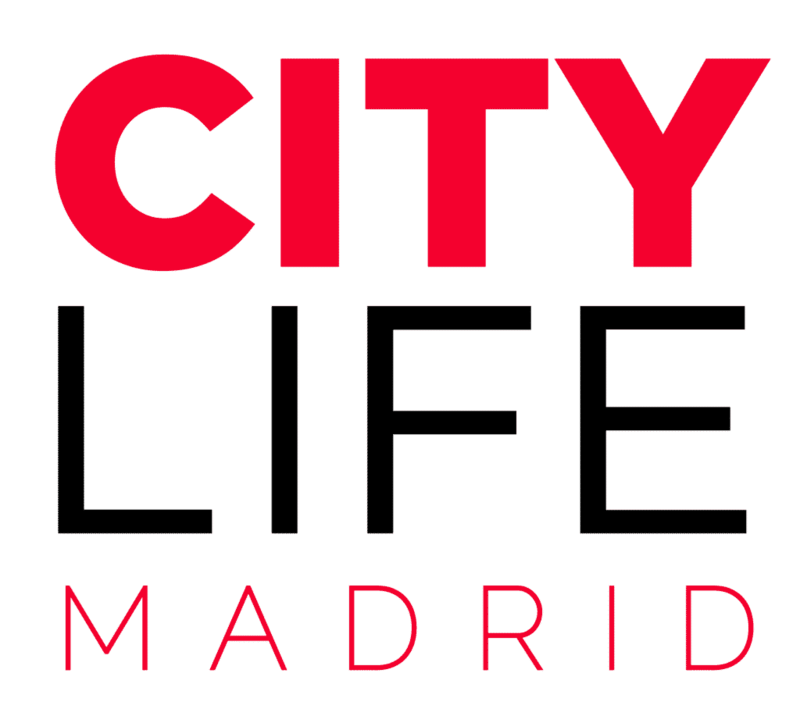 To check out the entire route visit the official Madrid events webpage! Some people have tried to walk this tour in the past, but for only 4€ the bus is a much better option! 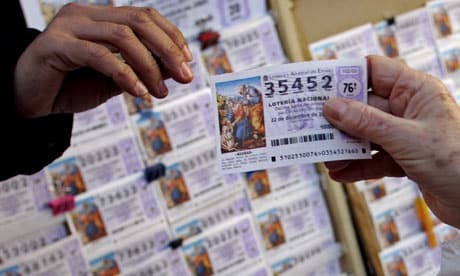 This is a tradition that goes beyond a simple lottery, it’s the second longest continuously running lottery in the world and as measured by the total prize payout, it’s considered the biggest lottery worldwide. The draw is always made on 22nd of December, so buy your ticket soon! Most people join together to buy tickets between co-workers, families, and friends because it’s such a huge payout. The period of selling tickets for the draw starts in July with different priced tickets. The most exciting part is the moment when El Gordo is drawn. The prize of El Gordo is 4.000.000 €. The total amount paid out is 2,240,000,000€. Majority of locals have the belief that you can’t accept an El Gordo ticket as a gift, you must pay for it, otherwise, it will not win! To read more, please click here! As Spain is still a very Catholic country, it’s traditions around Christmas time are less about Santa and more about Mary, Jesus, and The Three Kings. The Christmas Calendar is very much dictated around the different celebratory days of these specific Saints. Even though they don’t open presents on the 25th, Christmas Eve is still very important in Spain. Typically this is the biggest meal with the largest amount of people as the whole family gathers to eat delicious food for hours! Traditional Christmas Eve grub consists of roasted lamb, roasted pig, various seafood soups, salad, and any kind of tapas you can think of! In addition to Christmas Eve, there is another important feasting day for the Spanish and thats Día de los Reyes Magos (Three Kings Day) on January 6th. This is the day where children open presents and families celebrate the baptism of Jesus Christ. Typically on this day the family gathers for lunch where they enjoy all those delicious Spanish Sweets before heading to the big parades! The Spanish love their sugar and Christmas time brings out the most delicious recipes within each family. For the next few weeks, you will see stores and bakeries stocking their shelves with traditional Christmas sweets of the Christmas season. If you want to experience the most traditional Spanish Christmas possible, you must chow down on these delicious snacks! You can find these delicious desserts at shops and markets but you can also give making them yourself a try! 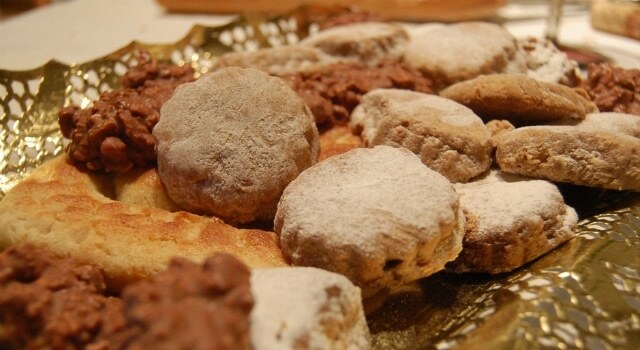 The most popular desserts are Turron, Marzapan, Polvorones, Mantecados, and Roscon de Reyes! The majority of Spaniards still take the religion aspect of Christmas very seriously. 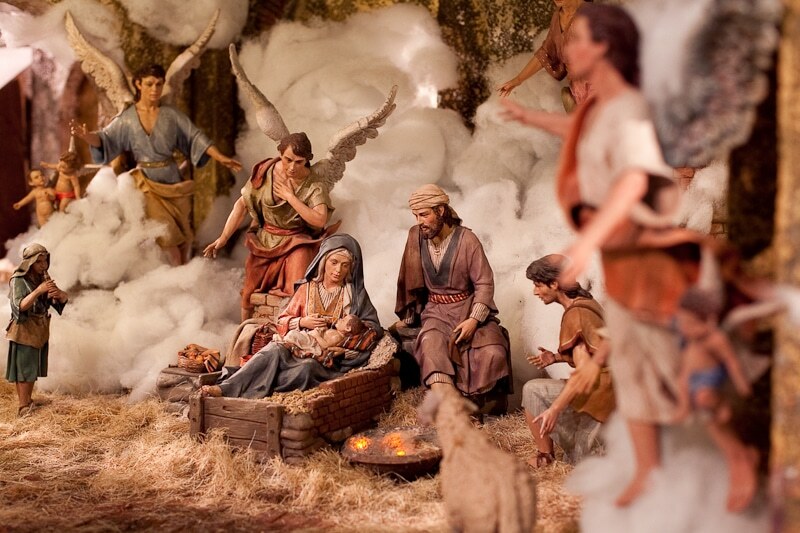 So, there is no surprise that a pivotal part of the Christmas season is the story of the birth of Jesus Christ. There are several locations around the city that set up large and beautifully detailed representations of the Nativity Scenes which feature entire cities. They are certainly something important to check out if you’re looking for a very traditional experience! Some of the most impressive scenes can be found at places like CentroCentro Palacio de Cibeles, Casa de la Villa, and Museo de San Isidro. Los Orígenes de Madrid. All exhibits are open from 10:00-20:00 and are completely free to visit!. New Years Eve is a wonderful evening to celebrate in Madrid! Before heading to their designated NYE bashes, madrileños gather in Puerta del Sol for the countdown! So grab some champagne, don’t forget the grapes and head to the plaza! Once you’ve reached the countdown, you have to try to eat all 12 grapes before the clock stops ringing! If you do, you’ll have good luck for the following year! Then you can pop your champagne, cheers with your friends and even the strangers around you and welcome in the new year! Soon after the final ring everyone will clear out the plaza and head to party the night away! During the Christmas season, the city turns into a beautiful and festive outdoor playground. Have some coffee or hot chocolate and join in the holiday spirit with your friends at the various indoor and outdoor rinks around the city. 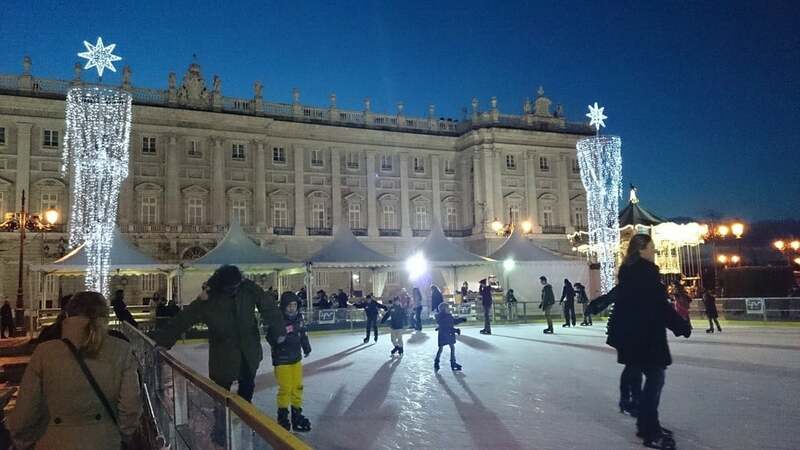 You will find ice rinks located at Callao, Plaza la Luna, Plaza de Oriente, Palacio de Hielo, Plaza de Felipe II. Keep an eye on our activities calendar for future free ice skating events! This one takes place in the new year, but keeps the Christmas vibes going! The biggest parade here in Madrid is the Three Kings Parade (Cabalgata de Reyes). A glorious night where the entire city gathers in the streets to receive the Three Kings on their journey through the city! 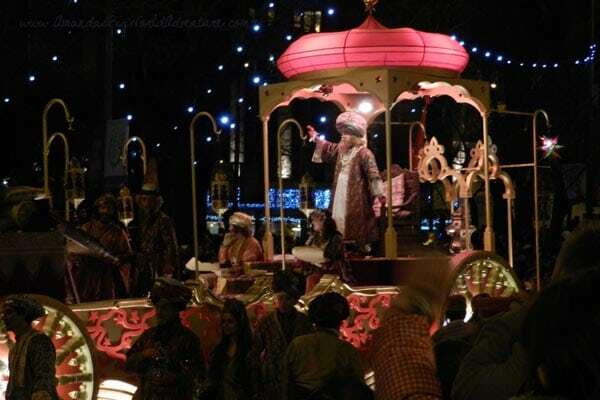 The parade is extremely elaborate with camels, carriages, people dressed as shepherds, townspeople and the Three Kings all throwing sweets into the crowd. To add to the theatrics, there is always a marching band and several performances on each float! 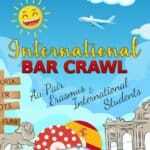 The parade begins at 18:00 in Avenida de la Castellana and continues to Plaza de Colon on the 5th of January! The parade usually ends around 20:30.